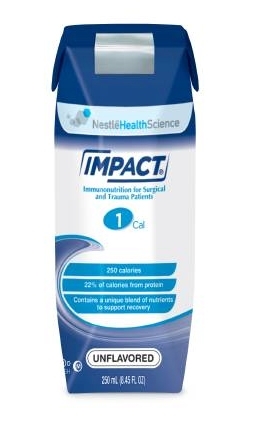 Impact® 1 Cal is a tube feeding formula providing specialized nutrition for surgical and trauma patients. It is an unflavored formula that is nutritionally complete. This product is designed for individuals suffering from critical illness and at a high risk for infection. Comes in 250 mL containers (8.45 ounce). Contains a blend of arginine, omega-3 fatty acids and nucleotides to support the immune response. For tube feeding use only. Appropriate for lactose-intolerance*, gluten free, low-residue, kosher, and halal. * Not for individuals with galactosemia. This product is a medical food intended for use as directed by a medical professional. It is not intended to diagnose, treat, cure or prevent disease. Not indicated when immune suppression is desired. Detailed nutritional information is listed on the Nutritional Information tab of this page and the ingredients are on the Ingredients tab. Water, Maltodextrin, Sodium Caseinate (from Milk), Palm Kernel Oil, L-Arginine, Calcium Caseinate, Refined Fish Oil (Anchovy, Sardine), and less than 1% of Citric Acid, High Linoleic Safflower Oil, Magnesium Chloride, Potassium Citrate, Calcium Phosphate, Sodium Citrate, Yeast Extract, Cellulose Gel, Hydroxylated Soy Lecithin, Potassium Chloride, Potassium Phosphate, High Oleic Sunflower Oil, Sodium Ascorbate, Choline Chloride, Carrageenan, Cellulose Gum, Alpha-Tocopheryl Acetate, Zinc Sulfate, Ferrous Sulfate, Niacinamide, Vitamin A Palmitate, Copper Gluconate, Calcium Pantothenate, Vitamin D3, Manganese Sulfate, Thiamine Hydrochloride, Beta Carotene, Pyridoxine Hydrochloride, Riboflavin, Folic Acid, Chromium Chloride, Sodium Molybdate, Biotin, Sodium Selenite, Potassium Iodide, Phytonadione, Vitamin B12.